Portland has been churning along as the nation's leading craft beer market for years. 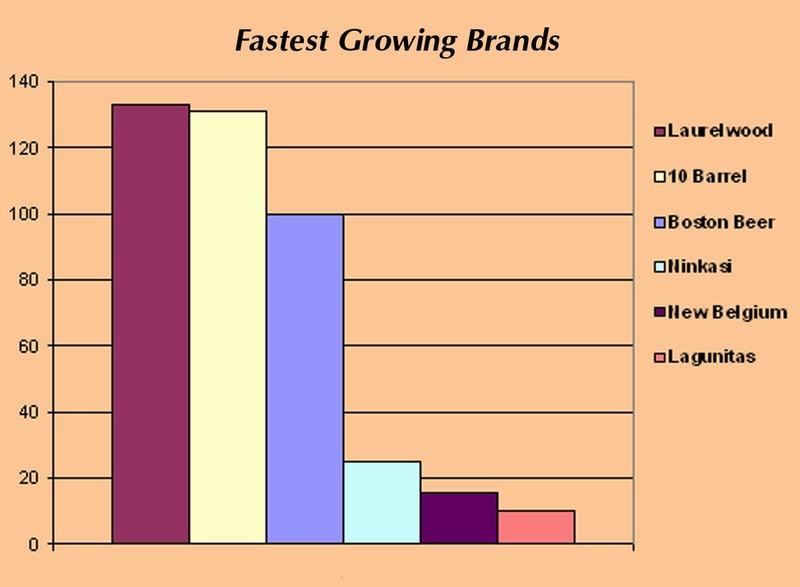 Yet craft always trailed the combined retail dollar market share of Anheuser-Busch and MillerCoors. For apparently the first time, that reality has been altered, quite possibly for good. 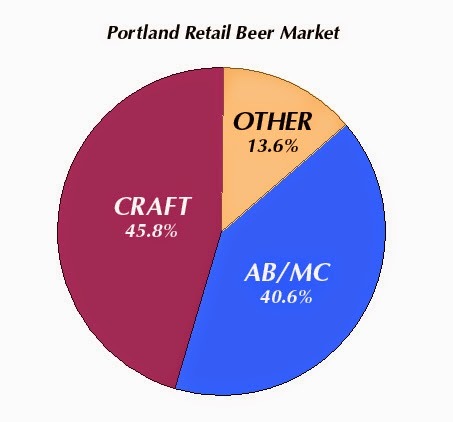 The basic story is this: With an overall increase of 3.8 share (16.3 percent increase in dollar sales), craft now owns a 45.8 percent dollar share of the Portland market. Anheuser-Busch and MillerCoors, down a combined 2.1 share for the quarter, dropped to 40.6 percent share. These are YTD figures for the first quarter of 2014, ending March 31. These numbers were reported in the Craft Brew News and forwarded to me by an industry source. The Craft Brew News, published weekly, bases much of its reporting on data provided by Information Resources, Inc., a global market research organization headquartered in Chicago. The IRI provides its clients with retail market intelligence and analysis on consumer packaged goods. It collects data from grocery stores, convenience store chains and other retailers. All products are fair game: beer, wine, food items, candy, toothpaste, etc. A mess of data, for sure. There are some big winners in the report. Boston Beer doubled sales and gained 1.6 share to finish at 3.5. That's not beer, though. The Craft Brew News says BB gains are mostly attributable to Angry Orchard Cider, up 73 percent and 2 share. Portland's cider market is raging. Gains by Boston Beer and Ninkasi, up 25 percent to 3.4 share, allowed both to pass Heineken USA, down 3 percent to 2.8 share. Some of the crazy gains came among breweries that are building momentum. 10 Barrel's dollar sales were up 131 percent and it gained a full share to finish at 1.8. New Belgium (up 15 percent), Lagunitas (up 10 percent) and Sierra Nevada (flat) together accounted for nearly 5 share of the market. Bridgeport (2.6 share) and Full Sail (2.2 share) held steady. Then there's Laurelwood It seems the decision to put six-packs of Workhorse IPA and Free Range Red on store shelves in Portland (and around the Northwest) is paying off in a big way. Laurelwood sales jumped 133 percent and it doubled dollar share from .3 to .6. A full share seems imminent. This surely could not have happened without the six-packs and aggressive marketing efforts. Of course, you can't have winners without losers. It was a difficult quarter for large suppliers. Anheuser-Busch, MillerCoors, the Craft Brew Alliance, Deschutes, Crown and Pabst lost a combined 3.9 share. The CBA saw sales decline 13 percent and lost 1.4 share to 6.2. Deschutes sales were up .7 percent, but it lost .4 share to 6.1. Significantly, AB and MC lost market share even though combined dollar sales were up 1.5 percent. What do the numbers mean? First, keep in mind these are retail numbers. If draft numbers were incorporated, craft's position would look even stronger. It seems likely the growth trend will continue and that big beer will lose more share to craft in Portland. San Francisco and Seattle, both mature and rapidly growing craft markets, will likely see craft pass AB/MC share in the next year or so. Volatility is another issue. If your sales numbers aren't strong, you're likely losing dollar share (see Deschutes). Big beer increased dollar sales mainly via price increases, not volume, and lost share. That may put them in a bind going forward. We'll see. The point is, there is massive pressure from newbies and fast-trackers who want to tap this hyper-competitive market. If you're looking for a connection between these numbers and last week's OLCC figures, you'll see some parallels. But remember the OLCC tracks beer brewed and sold in Oregon in any form. The data tracked here is strictly for packaged retail sales in Portland without regard for where the product is produced. A big difference. The takeaway? Hang onto your hat regardless of your position in this crazy market. These are unchartered, wild waters. Nothing is sacred and no one is secure. What's the source for this data? The story I'm borrowing from appeared in the April 22 issue of the Craft Brew News. The article identifies IRI (Information Resources, Inc.) stores in Portland as the source of the raw data. My understanding is these are reliable numbers. The article was sent to me by an industry source. Congratulations, Portland, you did it! On behalf of your beer-loving brothers and sisters up north in Seattle, cheers! We will try to keep up. I wonder if Rebel IPA helped BBC in any way. In this market, I doubt a BB IPA is going to have much traction. But it probably didn't hurt. Consumers, even here, are more likely to buy a beer like that in a store than on draft. In fact, I haven't seen it on draft in any of the places I frequent...for good reason.